I would like to rsvp for 3 people. link doesn’t not allow. thank you. hank you for responding to our mailing concerning our upcoming Klenengan. Please note, seats can not be reserved for this event. The rsvp gives us an idea of how many people plan to attend the event. Doors will open at 3:30 p.m. The event will begin at 4 p.m. and last until midnight with a dinner break (for the musicians) from 7 – 8. 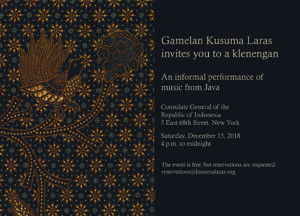 During this break, the audience will have a chance to learn more about the gamelan. You are welcome to come and go throughout the performance.